Sixteen-year-old Taylor Quinn listens to his favorite song, "Feliz Navidad," sung by his favorite performer, Jose Feliciano, every day "over and over and over again," according to his mother, Cyd Quinn. So when the New Canaan woman learned that the eight-time Grammy Award-winning composer, singer and guitarist was performing Monday at the Westport Health Care Center she took Taylor to hear a live performance of the popular holiday classic. Feliciano, a Weston resident, closed the hour-long concert with Feliz Navidad, inviting the audience to join him -- and they did. The song was recognized in 1998 by the American Society of Composers, Authors and Publishers as one of the 25 most performed Christmas songs of the 20th Century. In 2009, the National Academy of Recording Arts and Sciences inducted the song into the Grammy Hall of Fame. Feliciano performed with eight local musicians, two of whom -- Suzanne Sheridan of Westport and Vicki Ferrara of Fairfield -- have shared the stage with him regularly at this annual concert. The native of Puerto Rico, who has been blind since birth, began performing at the nursing home more than 15 years ago. Although Feliciano has performed on some lofty stages, including at the Papal Mass in Yankee Stadium during Pope Benedict XVI's 2008 New York visit, he volunteers his time and talent for this concert each year as a means of giving back to the community. After the hour-long concert of Christmas music, Feliciano mingled with the audience at an informal reception, where Taylor got to meet his idol and he called the experience "a dream come true." He wasn't alone in his effusive praise for Feliciano. Douglas DeAndrea, director of food services for the center, was also star struck. "I became a fan of Jose's when he did the cover of the Doors' `Light My Fire.' He also did the theme song for (the television show) `Chico and the Man,' and he's one of the best guitarists in the world," said DeAndrea, who brought two of his Feliciano CDs with him and had the famed musician autograph both. Feliciano opened the concert with "Winter Wonderland," then entertained the audience of about 50 people -- including nursing home residents, staff and friends -- with his rendition of Elvis Presley's I'll Remember You, which will appear on his new album, "Elvis Presley by Jose Feliciano," due out next summer. "I'm having so much fun doing this album in my studio," Feliciano said. "I'm an Elvis fan, always have been. I was 5 years old when I came to New York. Six years later when Elvis came on the scene in 1956, Heartbreak Hotel inspired me. Today, he said, "I'm happy that I am who I am, but when I was 11 years old I wanted to be Elvis ... Nobody's had the courage to attempted to do Elvis' music but in their own style, so that's what I'm doing," Feliciano said. He is also working in his studio on an album of music sung in Spanish titled "Alma Rebelde," or Rebellious Soul. Feliciano performed moving renditions of "Have Yourself a Merry Little Christmas," "White Christmas" and "The Little Drummer Boy." On the latter, he tapped his guitar rather than strumming its strings, and he got accompanying percussion from Marion Najamy, the Westport Health Care Center's administrator. Najamy said Feliciano's appearance signifies the facility's goal to complement its health care and rehabilitative services with an on-going arts program of music and art for its residents, clients and greater community. "They look forward to the socialization. It makes them feel important that someone would invest their time for their happiness; and music touches everybody," said Leah Bisson, the center's director of recreation. 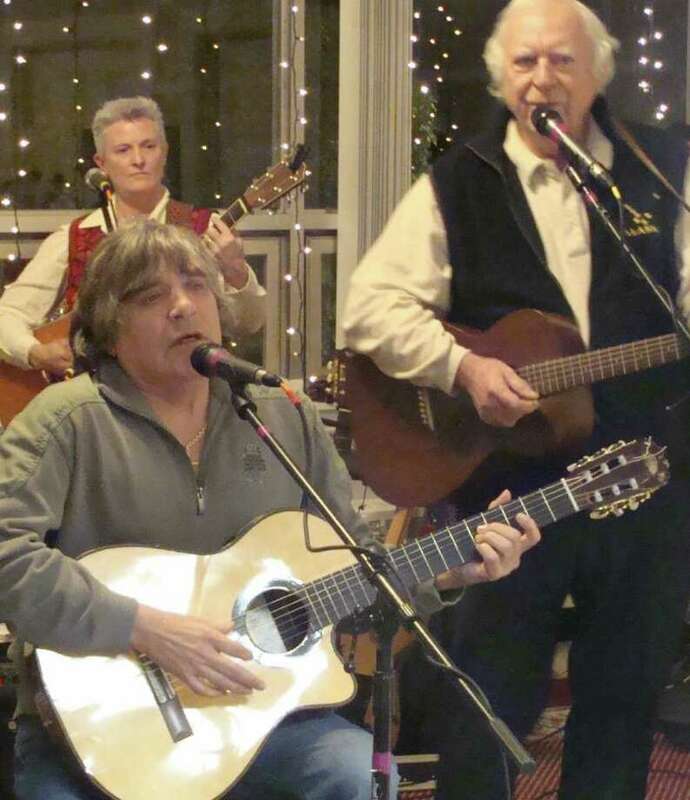 Bill Rother, a Weston resident, long-time friend and former tour manager of Feliciano's, sang Hawaiian songs, and Sheridan sang "Rockin' Around the Christmas Tree" and "O, Holy Night." "This song makes it Christmas for me," she said. Barbara Barreira of Stratford, a short-term resident at the center, said she has been a Feliciano fan for a long time. "I just met him in person today. I never heard him perform in person before. I had so much fun," she said of the musician who has more Grammy Awards than the Beatles and Elvis Presley, according to Rother. Last month, the Latin Academy of Recording Arts and Sciences presented Feliciano with the Latin Grammy's Lifetime Achievement Award.